Charcot neuroarthropathy is a devastating foot disorder whose differential diagnosis with infectious, bone or articular disease is difficult. We report a rare case of a woman with diabetes who developed bilateral Charcot neuroarthropathy after erysipelas of her left leg and subsequent trauma, which complicated diagnosis as well as efficient off-loading. Charcot neuroarthropathy (CN) of the foot is a rare but debilitating disorder that affects bones, joints and soft tissues and leads to significant deformity unless diagnosis is established early. We report a case of bilateral synchronous CN that proved particularly challenging because diagnosis was obfuscated 1) by bilateral symptomatology and 2) a preceding erysipelas. In addition, we had no prior experience in off-loading both limbs simultaneously. A 58-year old woman with insulin dependent type 2 diabetes and lower limb neuropathy presented to the emergency department with fever and erythema of the left leg. The limb was erythematous and warm with a plantar neuropathic ulcer on the left hallux. Distal pulses were detected bilaterally. Blood sampling showed overt inflammation. The diagnosis of erysipelas was established with the toe ulcer as entry point. A wound smear revealed Pseudomonas aeruginosa for which intravenous antibiotics were administered for 8 days. She returned with increased oedema and pain of her leg two weeks later, although inflammatory blood parameters had normalised. Ten days later inflammatory symptoms had persisted and spread to the contralateral foot and ankle: both feet now were swollen, red and warm, and some bruises from a recent trauma were detected. X-rays of both feet were normal. 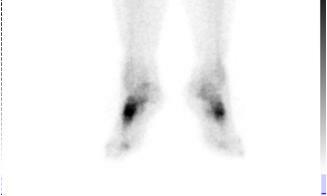 A bone scintigraphy with SPECT-CT (Single Photon Emission Computed Tomography) was suggestive for CN of both feet, with tracer uptake in the midfoot (Figure 1a) and small bony fragments on CT (Figure 1b). Hotspots over the 2nd metatarsal heads bilaterally raised the possibility of underlying osteomyelitis. Bilateral immobilization with total contact casts (TCC) was deemed impracticable. Hence, the left foot was treated with a removable air-cushioned cast (Aircast®) but this required the patient to be hospitalized. Oedema of the tarsus and metatarsal bases shown on magnetic resonance imaging (MRI) confirmed bilateral CN (Figure 2a) but osteomyelitis of the 2nd metatarsal head was rejected by leucocyte scan with SPECT-CT. Transfer to a rehabilitation centre and regular ambulatory appointments to renew the TCC were initiated. 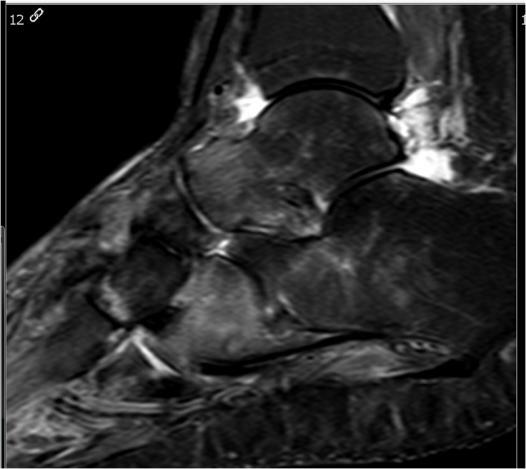 Three months later clinical inflammatory signs and oedema of the midfoot on control MRI had decreased, although increased oedema was observed at the talar bone bilaterally (Figure 2b). Off-loading was continued with bilateral Aircast® walkers for another 3 months until orthopaedic shoes became available. Final ambulatory rehabilitation was satisfactory. Figure 1 (a) Bone scintigraphy shows tracer uptake in the midfoot and 2nd metatarsal heads bilaterally. (b) Irregular margins and bone fragments in the midfoot are seen on SPECT-CT.
Charcot neuroarthropathy or Charcot foot is a devastating complication of neuropathy which is mostly seen as a rare complication of longstanding diabetes [1-5]. Men and women are equally affected [2,6]. Until recently, the prevailing hypothesis for pathogenesis was neurotraumatic or neurovascular [2,7,8]. Authors have observed however that CN is also associated with an enhanced inflammatory response, presumably triggered by minor trauma, prior infection, ulceration or foot surgery. Pro-inflammatory cytokines (TNF-α, IL-1ß) are released and lead to increased expression of receptor activator of nuclear factor-κB (RANK) ligand, thereby activating NF-κB (Nuclear Factor κB), a potent promotor of osteoclastic activity which promotes osteolysis and fractures [1,2,8,9]. The prevalence of CN is underestimated but affects less than 1% of all patients with diabetes [6,8-10]. Moreover, local inflammation is inhibited by limited arterial inflow, a frequent occurrence in patients prone to macrovascular disease . Ipsilateral recurrence of CN is rare . Over several years, contralateral CN may occur in 20% to 30% [6,7,11]. Off-loading of the index foot has been suggested as the initiating event that may develop CN at the contralateral foot . 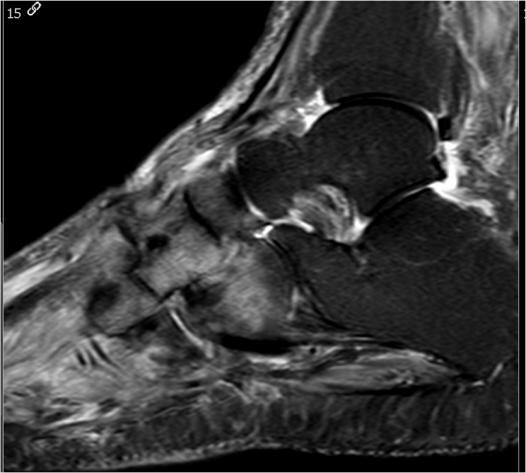 Figure 2 (a) MRI of the right foot initially shows bone marrow oedema of the tarsus and metatarsal bases. (b) Three months later oedema in the original regions has improved but is now more prominent in the talar bone. Diagnosis of acute Charcot foot is primarily established clinically because no specific laboratory tests are available: a unilateral red, warm, swollen foot that is remarkably painless due to neuropathy. Differential diagnosis should be made with infection (cellulitis, osteomyelitis, arthritis, abscess), acute gout, deep venous thrombosis and trauma (sprain, fracture) [1-4,11,12]. Imaging techniques are helpful but X-rays lack sensitivity during the first weeks. The sensitivity of bone scintigraphy is superior and its low specificity is improved by SPECT-CT. MRI has diagnostic accuracy in the early stages and allows differentiation from osteomyelitis [1-3,11]. According to literature, the diagnosis of CN may be missed in 79% and delayed up to 29 weeks . Unfortunately, early recognition of CN and prompt treatment is mandatory to prevent foot deformation. Rapid immobilisation of the affected foot is paramount and accomplished best by TCC, the gold standard for off-loading [1,13]. A removable pneumatic walker achieves comparable off-loading but non-compliance remains a problem [4,10]. Immobilisation is advised until clinical signs have resolved and a temperature difference of <2°C between feet is recorded [1,9,14]. In general, this occurs after 3-12 months, with 6 months being most common [10,11,14]. Bisphosphonates which inhibit bone resorption have been suggested as adjunctive therapy but current data do not support their routine use . Bilateral synchronous CN as reported in the presented case is not only an extremely rare occurrence, but also greatly complicates diagnosis and subsequent immobilisation/off-loading. To our knowledge, only one similar case has previously been reported: a man in which contralateral CN presumably was elicited two weeks after off-loading his index foot with a TCC . In our case, a skin infection probably triggered CN on the index side which unfortunately also delayed diagnosis. On the contralateral side both the overloading of the right foot due to pain on the left side, or trauma may have been the trigger for CN. The number of radiological exams that had to be performed, and their conflicting findings demonstrate how difficult a diagnosis can be. Long-term immobilisation and off-loading of both limbs was extremely debilitating to our patient and justified hospitalisation in a rehabilitation centre. In summary, diagnosis of acute Charcot foot is challenging, especially when triggered by prior infection or trauma. Bilateral CN, although extremely rare, further complicates the diagnosis as well as efficient off-loading and immobilisation.